The all-new PvP+PvE experience will be available from September 20th. 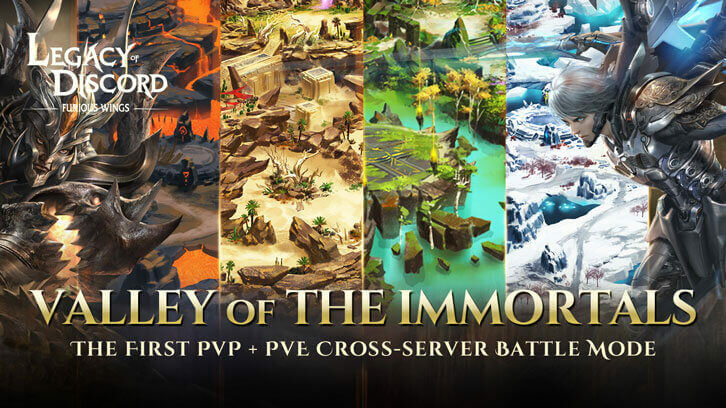 Valley of the Immortals, a brand-new cross-server battleground is coming to Legacy of Discord from 20th September. Players will be able to engage in both PvP and PvE combat across four different maps that represent the four guardian animals of the valley. They can obtain special loot, materials, and treasure chests from the other players, monsters, and bosses they defeat. The story starts with three of the four guardian animals of the Valley of the Immortals being corrupted by the forces of evil. The seal that once prevented entry into this holy valley has broken and magic has flooded these once-forbidden lands. Upon hearing the news of the valley’s downfall, the Prophet of Light, Borne, rushed to come to its aid, covering it in a shield of light. They now hope beyond hope that they can purify the darkness within. Starting from level 76, players will get entry passes every day to enter the Valley of the Immortals, with each entry costing a pass. Players will be organized in server vs server teams and will be able to collect damage reduction and damage boosting buffs. Any players or monsters that are killed will drop loot. Treasure chests and Easter Eggs are also hidden throughout the world for players to find. Players will be able to join without an entry pass 30 minutes before one of the terrifying bosses spawns, up until it dies. These bosses are not creatures players can take-on on their own, you will need to gather your friends, and maybe their friends as well to take them down to get their bountiful rewards. Everyone will need to be extra careful while traversing the valley, any player that gets killed will get ported back to the capital city and will need to use an entry pass to re-enter the valley. Enter Legacy of Discord from the 20th September to explore the Valley of the Immortals and plunder the treasures now ripe for the taking.